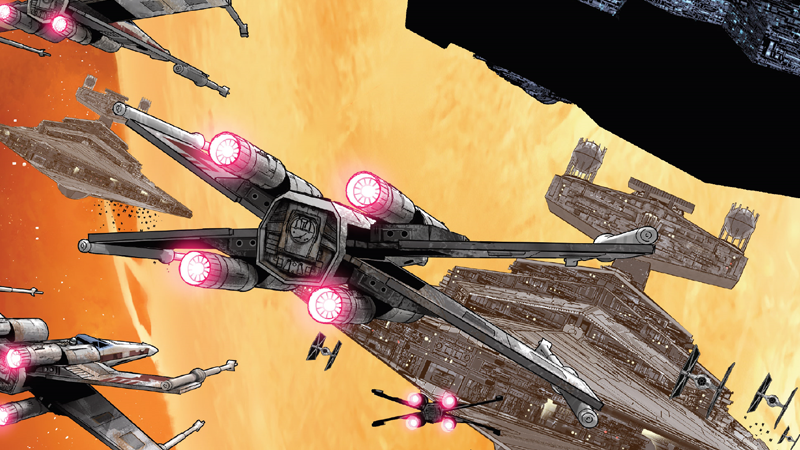 Rogue Squadron takes flight for the first time in Star Wars #52. In the old Star Wars canon, Rogue Squadron—the legendary group of Rebel pilots who faced impossible odds and defied fate on the regular as ace pilot heroes—had a rather pedestrian origin. But now Rogue Group has been given its official, Disney-era origin, and it’s gotten a major connection to the new Star Wars movies in the process. Back in the old EU, Rogue Squadron’s start was more out of necessity than anything particularly poetic. Given that the squadron was already seen in action on Hoth during The Empire Strikes Back, EU canon simply facilitated its creation as an administrative task. After the destruction of the Death Star, the Alliance reformed what was left of its tattered fighter wings into two task forces that would help defend the Alliance fleet as they fled Yavin IV and scouted out a new base: Renegade Flight and Rogue Flight. 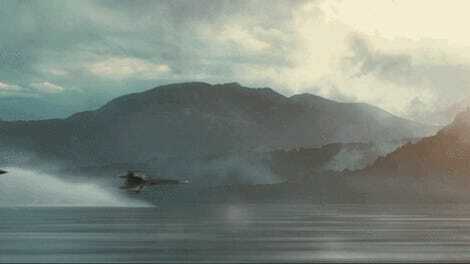 For his bravery in the battle above Yavin’s moons, Luke was given command of Rogue Flight, and thus one of the most legendary starfighter squadrons in Star Wars history was born. This week’s Star Wars #52—by Keiron Gillen, Salvador Larroca, Guru e-FX, and Clayton Cowles—forges the Rogues in an altogether more sentimental crucible. The latest storyline of the ongoing series has seen the Alliance secure a much-needed bolster to their fleet in the form of a raft of Mon Calamari cruisers, only to be immediately waylaid by a betrayal that sees their new fleet disabled as Darth Vader and a swathe of Star Destroyers show up to crush the Rebels once and for all. Darth Vader getting a flare for drama back in Star Wars #50. Star Wars #52 mostly focuses on the ragged initial response by the Alliance to this surprise attack—with key systems on their new ships sabotaged, communications are down and their fighters can’t make it out of the hangar bays, leaving Luke and his friends to helplessly watch their comrades get picked off. That is, until Han manages to get a message out to Luke’s fighter bay that there’s a way to override the hangar fail-safes and open the bay doors—by literally flying head first into them, which is a very peculiar fail-safe, honestly. Luke can’t give up on a chance to get out and start fighting back, however, even if there is a significant chance he could end up smearing his X-Wing on the side of a locked hangar bay door. Luke invokes Jyn’s name as he prepares to potentially smash straight into a locked hangar bay. So, invoking the memory of Rogue One lead character Jyn Erso’s own defiance of Rebel orders, he hops in his X-Wing and tries Han’s plan, opening the doors for Wedge and a small group of other X-Wings to make it out into the battlefield. Although he gets chided for sentimentality when there are more important things for the pilots to worry about—like, say, a fleet of Star Destroyers!—Luke invokes the callsign of Rogue One once more, officially dubbing this order-defying new group Rogue Squadron. Kieron Gillen’s run on Star Wars began with a closer exploration of the links between our main Star Wars heroes and Jyn’s sacrifice during the events of Rogue One, so there’s a basis for Luke to admire, and choose to honor, the ill-fated strike team in a similar moment of desperation. And even before we knew what Rogue One was actually going to be as a movie, we were speculating about its name having a deeper connection to the beloved pilots of Rogue Squadron. Rogue Squadron forms up, with a dash of Skywalker-brand sentimentality. But even then, this feels like a bit of a contrivance to smush the Star Wars Story movies and the saga at large together even more than they already are. It’s a connection that makes sense, but at the same time only serves to make the Star Wars galaxy feel a bit smaller than it should be. At least the Rogues have got their official origin now?